18th century map of the Burgundy wine region! 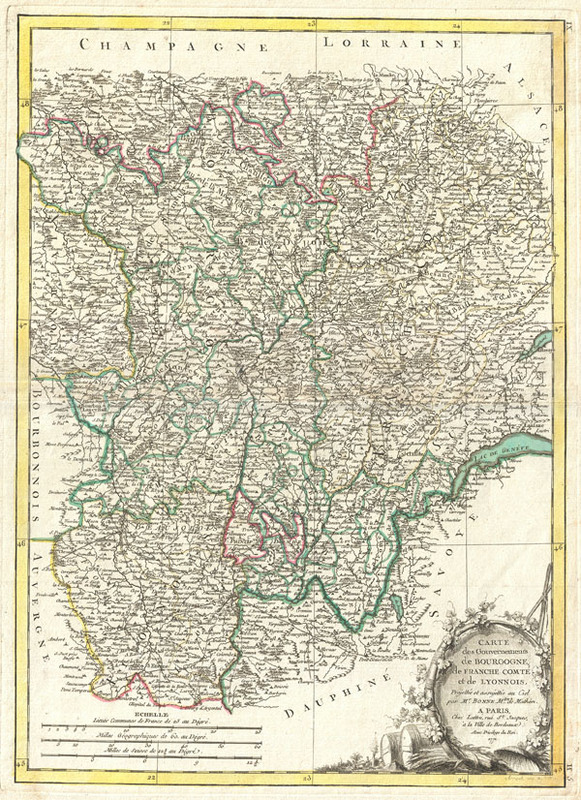 Carte des Gouvernements de Bourgogne, de Franche Comte et de Lyonnois. A beautiful example of Rigobert Bonne's decorative map of the French winemaking region of Burgundy, and the adjacent regions of Franche-Comte and Lyonnais. Covers the region in full from Champagne to Dauphine and from Auvergne to Savoy. This region is famed for producing the world's finest wines. A large decorative title cartouche appears in the lower right quadrant. Drawn by R. Bonne in 1771 for issue as plate no. H 5 in Jean Lattre's 1776 issue of the Atlas Moderne. Rumsey 2612.014. Phillips (Atlases) 664. National Maritime Museum, 215.